AN entertaining Round 12 saw traditional rivals, Carlton and Richmond go head-to-head and Collingwood defeated Melbourne University in a tight tussle. Our writers watched both of those matches and noted the outstanding performances from the weekend. Executed a nice pick-up off the deck and gave off a good handball to Natalie Plane. Delivered a great kick inside 50 that started the passage of play that resulted in a Kristi Harvey goal. Vescio moved higher up the ground in this game and created more opportunities through assists, as well as kicking it off her own boot. She combined the two well in a different role for her. Kicked a nice dribbling goal for her first of the game. Her second came from a good mark out the back and an easy conversion. Took a nice intercept mark and delivered a good clearing kick. Was able to follow up the ball well and got clean hands away on plenty of occasions. Pound ended up getting lots of the ball and used it well both by hand and by foot. Showed good endeavour to run towards 50 and try and boot through a goal. Followed this up with another bout of good endeavour to run and carry after a free kick. Hosking hunted the footy with purpose and as a result, got lots of the ball. She also won lots of free kicks because she went in hard for the ball and got rewarded. Executed nice run and carry to execute a switch kick. Took a nice mark on the flank and displayed good run and carry throughout the match. Gee seemed to always have space to run into which she was able to use well. Executed a good kick around the corner to Darcy Vescio. Gee’s marking and intent to move the footy on with the ball in hand was impressive. Took a nice mark and laid a nice tackle laid in the forward pocket. Bromage was able to turn her opponent inside out and showed good footy smarts to soccer the ball along the ground to get it forward. Showed strong hands again and followed it up with a good kick. Also displayed good bodywork to impact the contest. Delivered a nice centering ball which she used more than once to create scoring opportunities. Executed a nice kick to the top of the square to complement her good attacking work inside 50. Cox was able to evade her opponents well and followed it up with great kicks. Also applied good pressure on her opponent. Chuot played one of her best games for Carlton on Sunday. Displayed nice agility and good pace. This was demonstrated when she followed up her poor kick with sheer acceleration. She took an excellent stretched mark and demonstrated an excellent ability to play on from outside 50 to create a quick passage of play. She did well up and down the ground when rotating through back pocket to forward, excelling in both roles. Also spoiled a Phoebe Monahan kick inside 50, complementing a great game where she got plenty of the ball. Took a good mark and applied good pressure on Georgia Gee who was hunting down the ball fiercely. Executed a nice tap of the ball to get it forward. Took a couple of nice intercept marks on the day. Kicked well and showed good intent to hunt down the football. Graham also displayed good work to get rid of the ball before she got tackled and then executed a good follow-up to get it back after she had lost it. Laid a nice tackle laid on Gabriella Pound. Also displayed good run and carry and did well to avoid a chasing opponent. Laid an excellent smother on the pacey Georgia Gee, which generated plenty of crowd noise. Burry took a good mark on the outer side and laid an excellent run-down tackle to pressure a Kristi Harvey kick towards goal. Got plenty of the ball thanks to her fierce attack. Tesoriero would often run through players, going in hard for the footy on multiple occasions. Took an excellent mark on the boundary line for a shot at goal and laid a good tackle on Gabriella Pound to trap the ball inside 50 after a kick out. Tesoriero was also able to execute good hands, such as when she got clean hands out to Alice Edmonds. Demonstrated good agility and run and carry for a big kick inside 50 toward goal. Tried hard for the Tigers all game and racked up lots of disposals. Delivered a nice centering ball to the top of the goal square and did well to cut off a kick on another occasion. Monahan was able to get a handball away while being brought to ground. Gave off a good handball out of congestion while under pressure. Was a ball magnet across the ground. Her ability to run both ways was impressive and provided a good option for her teammates. Was not afraid to go in hard and win the footy, putting her body on the line. Applied plenty of pressure and took a heap of strong marks. Provided a good option across the ground and created a forward thrust for her side. Looked dangerous up forward, scrumming well and reading the flight of the ball. Showed some good dash out of the back half and helped to open up space across the ground. Kearney impressed with her ability to break free from tackles and use the footy effectively and efficiently. She peppered away at the goals and slotted a much-needed major in the third term. Racked up plenty of the ball and used the footy well. Good intercept mark and strong hands, she displayed her ability to read the flight of the ball. Strong hands to take a good intercept mark. Kept herself in the contest, bringing the ball to ground and giving her teammates an opportunity to run onto the ball and pick it up. Executed a long booming kick and provided a solid target in the forward line for Melbourne Uni. She had a stellar game. She was in everything from the get go, working hard to stop the forward thrusts from the Pies. 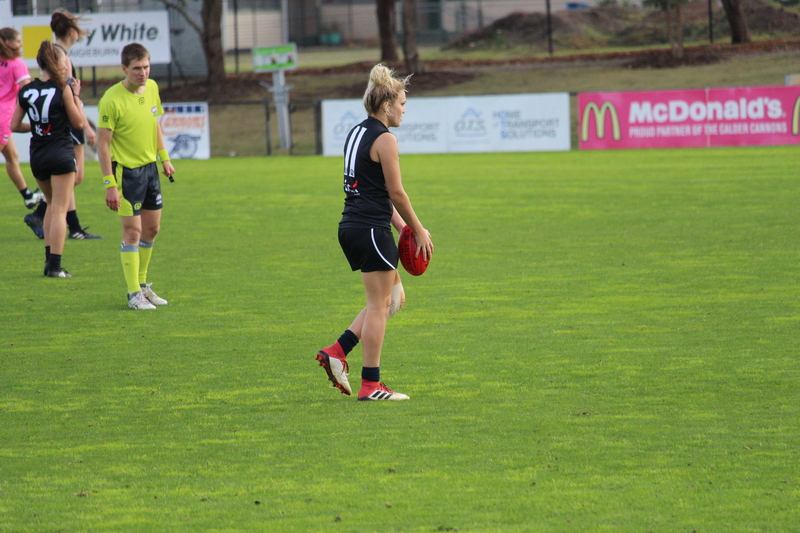 Gillespie-Jones had sticky fingers, impressing with her strong marks and good use of the footy. Her ability to read the play and drop back into holes was important for Melbourne Uni and she provided good link up play through the middle of the ground. Imposed herself around the contest with her strong body and footy smarts. Good strong penetrating kick and used the ball well. Was never far from the contest and wasn’t afraid to put her body on the line. Had a hard tag throughout the game but that did not seem to phase her, winning plenty of footy across the ground. Good strong mark and lead up at the footy. Had a set shot from about 35 metres out directly in front but was unable to capitalise, kicking it out on the full. Good speed to break away through the middle of the ground and set up a forward thrust. Used her break away speed to open up the space and propel her team forward. She showcased her clean hands and showed good agility to pick the ball up off her toes. Real classy player and displayed great composure given the repeat entries inside 50. Was a real ball magnet and set up a lot of play throughout the match. She showcased her ability to hit targets while under pressure and take strong marks. Executed a clean pick up off her toes and nailed an amazing goal from an impossible angle in the second quarter. She showcased her ability to dodge players and use the ball cleverly throughout the match. D’Arcy started the game off really well, strongly demonstrating her good hands while under pressure, taking an impressive mark going back with the flight in defence. Was in everything in the opening term and showcased her footy smarts with her clearing kick and ability to hit targets. Grant was solid down in defence and applied plenty of strong tackles on her opponents. She showcased her ability to win the footy at ground level, working hard to release the ball to teammates. She impressed with her strong hands and follow up work to provide a back-up play when her team needed her. Good clearing kick out of defence for the Pies and showed some good dash with ball in hand. Strong tackling pressure to trap the ball in Collingwood’s forward half. Positions well behind the ball and took a heap of good intercept marks at half back. Looked a bit rusty to start off with but worked herself into the game, credit to her footy smarts. Laid a strong tackle in the first quarter in which she chased her opponent down. Opened up the space for her teammates and created plenty of scoring opportunities with her quick kicks into one on ones in the forward 50. She was really impressive and worked hard all game to win the footy. Her effort in both defence and attack was second to none, getting involved in the contest. She applied plenty of pressure, tackling hard to trap the footy and taking a number of strong marks. Alexander was a real play maker up forward for the Pies, bagging two goals for the match. She looked dangerous throughout the match, hitting the packs hard and imposing herself in the forward half with her strong tackling pressure. She showcased her quick hands in and around congestion to move the ball out of the pack and into open space. ROUND seven sees the ladder-leaders in Geelong having a bye, meaning that this week is the time to shine for the next tier of teams. With traditional rivals doing battle and teams close on the ladder going head-to-head, this weekend’s Victorian Football League (VFL) Women’s action is unmissable. After losing their first game in four weeks, the Southern Saints will be hungry to regain that winning form. 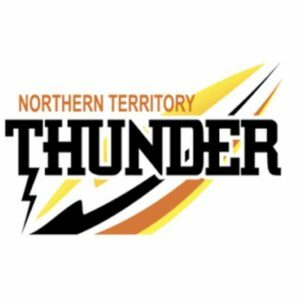 But coming up against the undefeated Northern Territory (NT) Thunder is no easy feat, as it sits second on the ladder with an average winning margin of 53 points. 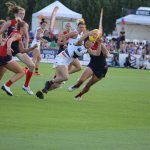 This match pits current AFLW stars against the next generation of potential elite footballers, as NT’s host of Adelaide players will do battle against some of the most exciting TAC Cup Girls players. Last time Sandringham star midfielder, Eleanor Brown played for the Saints, she amassed 25 disposals and kicked a goal, as did Eastern Ranges forward, Gabriella De Angelis. Expect big games from these talented players as well as Dandenong Stingrays duo, Courtney Jones and Shelley Heath, who both bring about X-factor in their game. Originally a curtain-raiser before the men’s game, the women now get their own stage on Saturday at Warrawee Park where a cracking match is set to take place. Both teams would be keen for a win, as the Pies are coming off a bye and the Blues are coming off their fourth consecutive loss. It is not all doom and gloom for Carlton though, as their leading disposal-getter in round four, Tyla Hanks comes back into the side following a solid performance in the big ‘V’ for Vic Country. She will be joined by a host of AFLW players such as Bridie Kennedy, Natalie Plane and Tilly Lucas-Rodd. It will be interesting to see how they match up against Collingwood’s AFLW contingent, which features the likes of Best and Fairest winner, Chloe Molloy, midfielder, Jaimee Lambert and defender, Sarah D’Arcy. With each team only tasting victory once this season, both sides would go into this game thinking that they are a chance to record their second win. 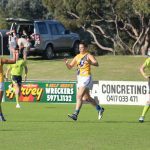 The Bulldogs come in with all the momentum, having recorded their first win of the season last week, when they thrashed Williamstown. Casey are not far off though, having defeated the Seagulls in the previous round. Demon, Harriet Cordner will have a tough task this week, as she will have to shut down the in-form Jessica Francke, who is coming off a five-goal performance. Be sure to keep an eye out for Vic Country captain, Jordyn Allen, who will start up forward for Casey to prove her versatility, after spending most of her TAC Cup Girls season either in defence or in the midfield. Unfortunately, this VFLW season hasn’t gone to plan for Melbourne Uni with the Mugars only recording one win so far. They will be thrilled to welcome back Calder Cannons captain, Madison Prespakis back into the midfield, after her last game saw her rack up 23 disposals. She will be able to take advantage of a Darebin side without two of its most influential midfielders, as AFLW duo, Lily Mithen and Nat Exon will not feature in a must-win clash for the Falcons. After a disappointing performance last week where no goal was scored for three quarters, expect a big game from gun forward, Hannah Mouncey, who did not kick a goal in the match at GMHBA Stadium. She currently leads the VFLW goal kicking tally with 12 goals from five games. After Carlton and Collingwood do battle on Saturday, another set of traditional rivals in Hawthorn and Essendon will go head-to-head on Sunday. The Hawks will be fancying their chances as they face a Bombers side who are yet to experience victory this season. Essendon will welcome in Calder Cannons young guns in Carla Rendelmann and Molly Warburton, but its forward line has taken a hit, as leading goal kicker, Alex Quigley and goal-sneak, Danielle Ponter will not take the field this week. It will be up to Canadian duo, Kendra Heil and Valerie Moreau to provide some X-factor inside 50. However, with an experienced Hawthorn defence featuring Meg Hutchins, Pepa Randall and Jayde Van Dyk, the task could prove quite difficult. 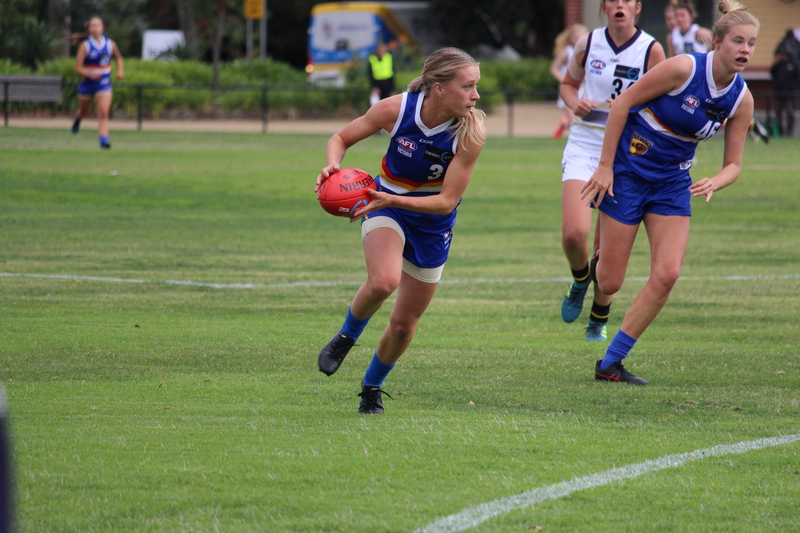 Keep an eye out for the brilliant kicking of Eastern Ranges co-captain, Emerson Woods and TAC Cup Girls teammate, Mikala Cann,who brings immense speed to the midfield thanks to her athletics background. The Vic Metro duo will take the field for the brown and gold for the first time this season. IT seems fitting that when it comes to crunching, it is only fair that crunching players is analysed. In the Round 5 edition of Number crunching for the Victorian Football League (VFL) Women’s competition, we look at the top 10 tacklers in season 2018 by average, and those that stood out on the weekend. 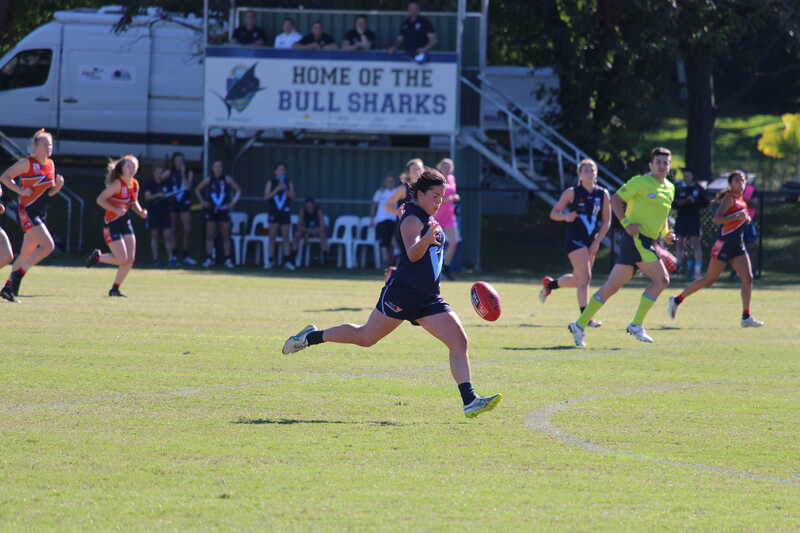 Essendon’s Hayley Bullas is far and away the leading tackler in the competition and she showed it on the weekend, with a whopping 18 tackles, to take her total to the season to 58 – an average of 11.6. Following Bullas is Southern Saints star midfielder Alison Drennan, who has laid an average of 9.75 tackles per game this season to sit in second, narrowly ahead of Geelong’s Renee Garing‘s whose nine tackles on the weekend was right on her average of 9.4 per game in 2018. 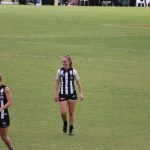 Collingwood AFL Women’s youngster Holly Whitford has continued her hard nosed attack on the contest this season, laying 40 tackles – the second most overall given Collingwood is yet to have a bye – for an average of eight per game. Her average matches up with Casey’s Marlee Tatham, and Western Bulldogs’ premiership player turned Seagull, Jenna Bruton. 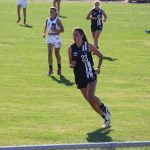 Carlton pair Courtney Bromage and Natalie Plane are next on the top 10 overall average list, followed by Southern Saints’ Monique Maitland and Hawthorn’s Steph Carroll rounding out list. 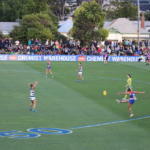 Taking a closer look at round five, Western Bulldogs’ Angelica Gogos was a huge tackler with 11 laid during the Bulldogs’ loss to Northern Territory Thunder, while Kate Gillespie-Jones laid 10 tackles in Melbourne University’s narrow loss to the Cats. 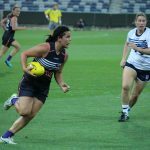 Three players laid nine tackles on the weekend – Melbourne Uni’s Candice Adams, Essendon’s Irena Malliaras and Casey’s Stacey Poke.